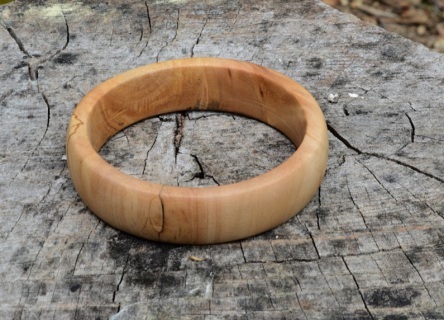 Many wooden rings are cut out from either a solid piece of wood, or a laminated, that is, wood layers are glued together. These types of rings are typically cut out on a lathe or drill press. They can be produced quickly and cheaply. 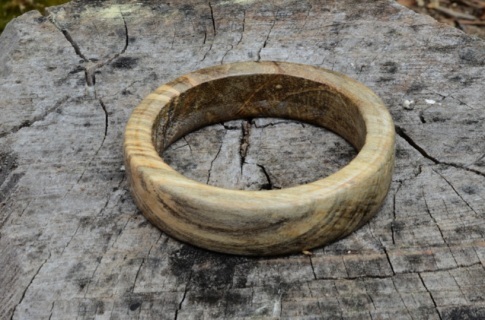 Solid-cut rings are quite fragile, as the ring will contain "short grain" and thus be more likely to split at this point. 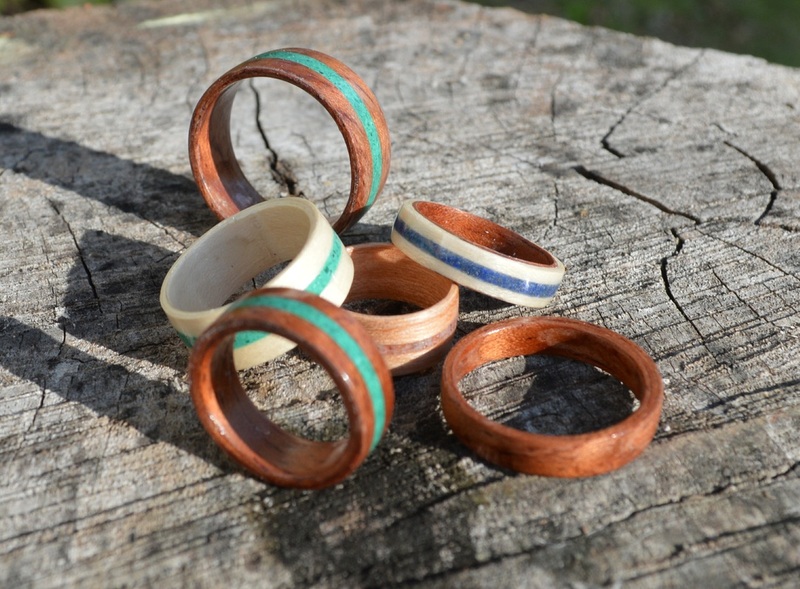 Laminate-cut rings are made of multiple layers of wood glued with opposing grain. 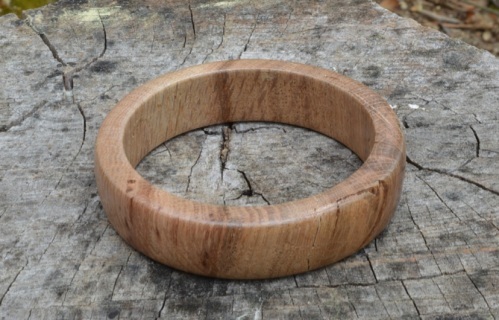 Although more durable than solid-cut rings they still have a few drawbacks; unattractive end grain, and waste. 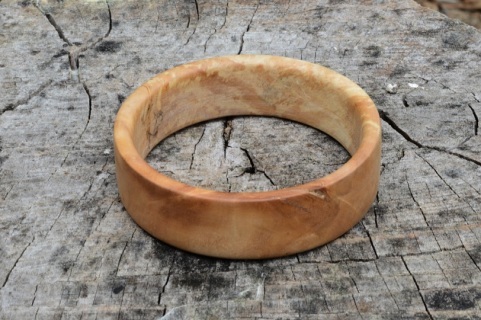 A bentwood ring has no points of short grain. The wood grain is oriented around the circumference of the ring, providing superior structural strength, as well as showing off the wood grain. Since the bentwood rings are made from thin strips that are cut to width and bent into a circle, there is very little waste, mainly in the form of fine dust when the ring is sanded. Bentwood rings demand more time and skill as the process is very much hands-on and meticulous, and this is reflected in the price. 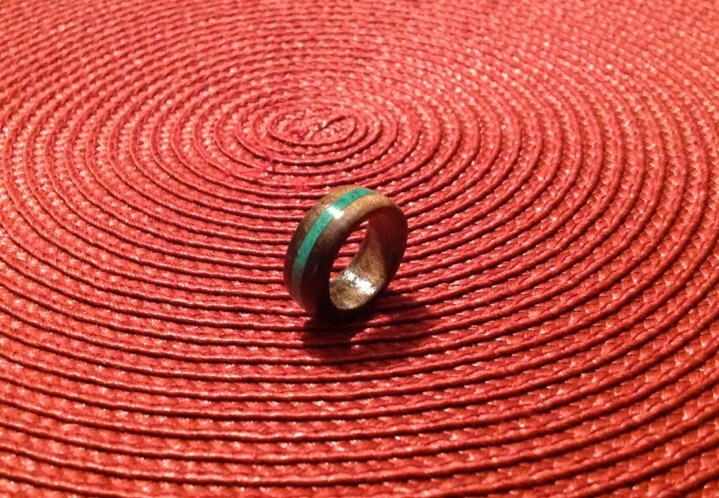 Below are some examples of the rings I have c﻿reate﻿d. 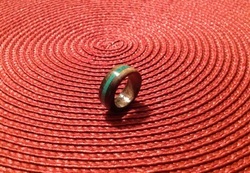 The green inlay is Malachite, the blue is Lapis Lazuli, I also have used Moonstone and Garnet for inlay. They are available to try on and purchase at ﻿﻿Lucky Tree Café and Local Art﻿. ﻿﻿If you don't see what you want there or have an idea of your own, I would be glad to work with you to design the ring you want ion your size.